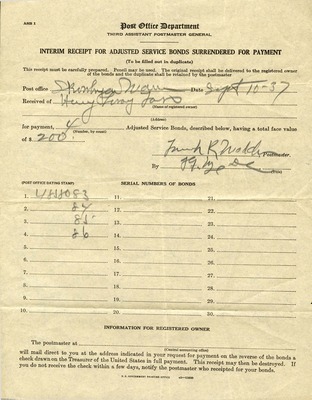 Henry L. Foss's interim receipt for service bonds, September 10, 1937 at the Skowhegan post office. Henery Leroy Foss has four bonds on this form and the total value is $200. Signed by Frank R. Madden, Postmaster. The designated clerk's initials are illegible.